Here is a warning. Save room for Foodcraft Espresso and Bakery's "famous Tella balls". Because only a treat-focused fool would eat them immediately upon arriving at this new Erskineville cafe. 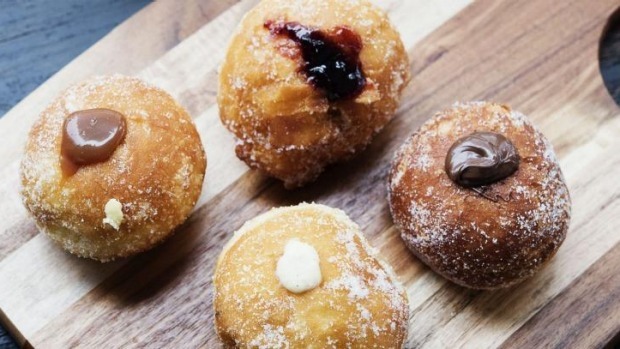 If I, ahem, did chow down on these sugar-coated doughnut globes filled with Nutella, ricotta, salted caramel or jam, straightaway, while thinking, "Oh, I'll have a look at the breakfast menu afterwards", what of it? So I had to have a little lie down on the grass outside after the fourth one. So I needed a fifth, to "test" how good the ricotta one was again. So I had to come back another day, when my face and hair and a large proportion of my clothing were not covered in sticky, fried, soft, moist, fluffy, sweet, Tella ball goodness, to see what else Foodcraft serves. So what? 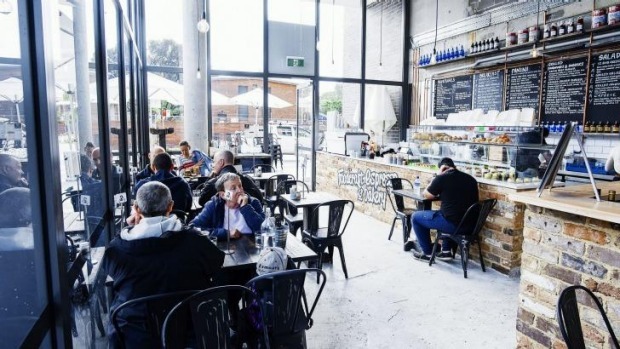 Five weeks after opening on the ground floor corner of a new apartment building in Erskineville, Foodcraft is heaving with weekend customers. An airy space with bare brick walls, tall windows and a soaring exposed ceiling, it also has an expansive outdoor area. Out there it's pet- and trainspotter-friendly as the 10.22am to St Peters, or a single-decker country train, trundle by on the raised railway line screened by deciduous trees. Reclaimed wood tables are set with Kalas sea salt (the best-selling salt in Greece) and metal Tolix-style chairs. Golden-glowing Edison-style bulbs are suspended above the front counter, vast cake display and white subway-tile kitchen, which bustles with a very intent-looking chef arranging food with the seriousness of a forensic specialist. There is also an extraordinary display of orchids in full bloom, and wall boxes of herbs which could be purely decorative, based on their distance from the kitchen. We've decided to sit inside to escape the cold but it's a freezing day. Outside under the many heaters could be toastier. Even the barista is wearing a padded jacket. Having learnt my Tella ball lesson, we order a New York Reuben, a toasted sandwich with braised corned beef, sauerkraut, Swiss cheese, Russian dressing and beer-battered chips. 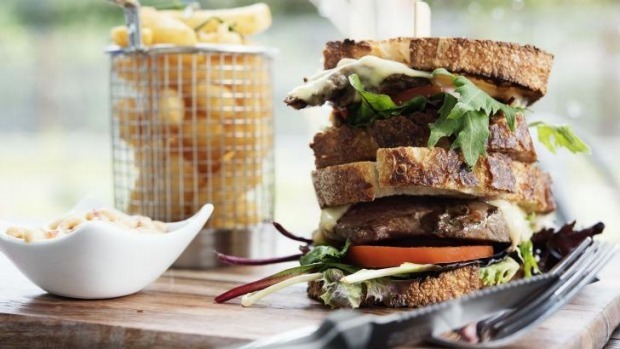 We also choose the steak sandwich, with grilled Scotch fillet on organic sourdough, caramelised onions, provolone cheese, roma tomato, mixed salad leaves and more beer-battered chips. Good thing the beer-battered chips, served in dinky metal baskets, are top-notch. Crunchy, golden magical things. They go straight down. Tap water and glasses arrive immediately with menus, although we are without cutlery. It arrives but we realise these sandwiches are better tackled by hand. The New York Reuben is a taste winner. The corned beef, tender and plump, works well with the tart sauerkraut and rich Russian dressing. The bread, organic sourdough baked on the premises, is fab. The steak sandwich is less of a sensation, let down by chewy meat, but the onions are good and so is the aioli and that excellent bread. Then our eyes swivel towards the cake counter. 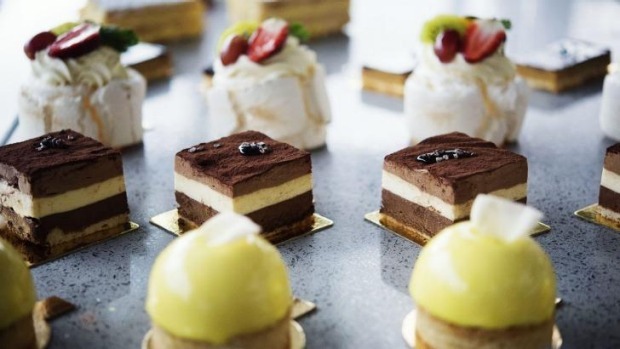 Tella balls stretch as far as the eye can see but there are other housemade delights: mango domes, choc brownies, citrus pillows, tiramisu, macaroons, chocolate eclairs and pavlova. What is with these people? Their savoury food menu is sizeable, with dishes split between breakfast and paninis, salad and grilled sandwiches and burgers. 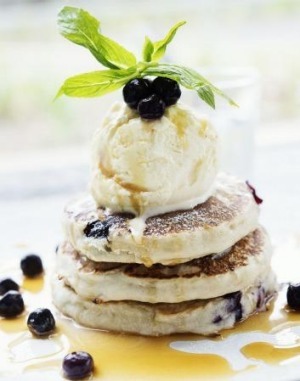 Portions of these are generous and I will come back and order the Italian baked eggs and buttermilk pancakes based on the happiness they bring to a nearby table. But this generous offering of cakes, this landscape of sweet treats, is mind-blowing. So I order more Tella balls, every flavour, and with a well-made creamy flat white, eat three. Just three. And quietly go outside, and lie down on the grass, and float away on a doughnut ball-induced haze I cannot recall the end of.